Hip-hop artist Young M.A. performs onstage during Power 105.1’s Powerhouse 2016 at Barclays Center in Brooklyn, N.Y., on Oct. 27, 2016. Young M.A., a gritty rap phenom who channeled the swagger of Brooklyn and the heart of ’90s East Coast hip-hop, slid onto radio airwaves across the nation in the throes of Drake’s Summer Sixteen Tour. “Ooouuu,” her viral single, is the first mainstream hip-hop record by an out, masculine-presenting lesbian that contains explicit affirmations of queer and gender-nonconforming identities. If Chance the Rapper represents the Carefree Black Boy, Young M.A. represents the Audacious Black Dyke—bold, unyielding and unapologetically herself. I have known and loved these women since I was 14, and they perplex and intrigue me in equal measure. This is why Young M.A.’s visibility is both exciting and deeply troubling. While there has never been a shortage of queer women in all facets of rap or music or artistry, Young M.A. is different. The unabashed declaration of herself as a lesbian and her masculine gender presentation are a marked departure from anything preceding her in mainstream hip-hop. 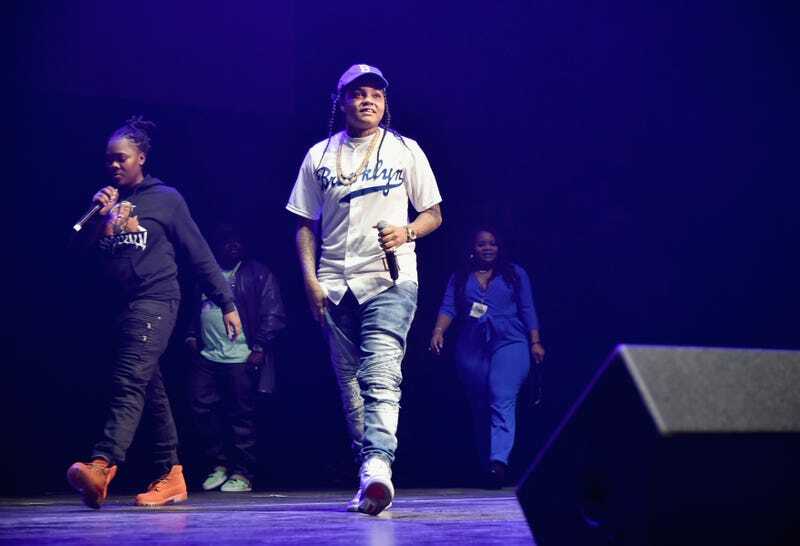 Upon first glance, it is easy to miss the revolutionary nature of Young M.A., but her presence in rap is a radical representation of how conversations around the fluidity of gender and sexuality in mainstream culture have created space in a genre that has been discarded as deeply and irredeemably misogynistic and homophobic. And yet her success, and the success of her gender-fluid counterparts, including Young Thug, are partly rooted in an affirmation of and nod to the old guard of gangsta rap: heterosexism and misogyny. My queer-feminist worldview could not have come into consciousness without the clapbacks of black women in rap, including Eve, Trina, Gangsta Boo, Mia X, La Chat, Lil’ Kim and many more. However, with painfully few exceptions, the last 20 years of black women in mainstream hip-hop have almost always maintained the straight-presenting, high-femme sexual aesthetic set forth by Lil’ Kim and Foxy Brown. Young M.A. meaningfully breaks this mold while walking in the beautiful and storied tradition of black studs, AGs, doms, bois and butches. Unfortunately, though, and perhaps expectedly, while black queer and transgender women are organizing toward black liberation on the front lines of movements and giving new language to building black power, Young M.A., in some ways, has used the cultural space largely created by black women to promote the re-enactment of elements of toxic masculinity. Her ascendance in rap raises an important question: Is visibility alone ever really radical? The answer is messy, complicated, uncertain and unclear. Importantly, queer masculine-of-center women like Young M.A. have been largely invisibilized because they are often either read as black men or experience being targeted and harassed because of their sexuality, gender and gender presentation. And yet, far too often, our masculine-of-center sistren—and femme ones, too, for that matter—aren’t immune to the adoption of gender norms and stereotypes that denigrate femininity, including femme women. Without deeply addressing how white supremacy, misogyny, heterosexism, cis-sexism, classism and other oppressive systems shape and manifest in our lives, we cannot do the critical work of building a black future that is liberatory to all black people. Visibility is important, but it is an inadequate placeholder for creating a truly liberatory value system. It has been “queered” to be the antithesis of normality. The queerness of blackness is what has resulted in the beautiful and remarkable creation that we call “black culture.” It is the reality that has given way to the ghettos and hip-hop and resistance that rappers have always rhymed about. What Young M.A. means for the future of black women in rap has yet to be determined, but we must vigilantly continue to make space for people like her while holding her accountable for the toxicity of messages she pushes around women. If we are working toward freedom, misogyny, no matter whose mouth it comes from, can have no seat at the table.